Loreto has plenty of choices for accommodation. 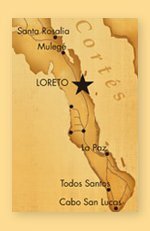 From high end experiences (although still very reasonably priced) such as La Mision along the Malecon, Posada de Flores in the central plaza district, and the Inn at Loreto Bay to more economical alternatives including Coco Cabanas, Motel El Dorado and Hotel Luna, you’re bound to find the right place at the right price. If you’re considering the Malecon, keep in mind that while the location is convenient and the views out to the Sea of Cortez stellar, you’ll sacrifice some peace and quiet. The Malecon is the cruising boulevard in Loreto, especially during the weekends when cars, often with loud music and no mufflers, drive up and down the strip. It’s all in good fun, and it is very safe, but just a heads up.